That's according to Hillary Clinton and Tim Kaine. That's what they said about Donald Trump, after all, for questioning the results of an election that hadn't even happened yet. Surely they must feel the same about Gillum and Abrams doing the same. Yet Abrams and Gillum continue to get away with irresponsible self-pity and delusion. When Abrams finally acknowledged defeat 10 days after the election, she said, "I will not concede because the erosion of our democracy is not right." She has since stated "it was not a free and fair election in Georgia." And finally last week, she said, "I did win my election, I just didn't get to to have the job." On a presidential run, Abrams says she feels she has to consider it b/c people like her aren’t frequently mentioned, & tshe has much to offer. Then, discussing her credentials, she added a possible Beto reference: "I did win my election, I just didn’t get to have the job." "With all due respect to everyone else in the race, I bring something to the table too. And I *did* win my election. I just didn't get to have the job." That will be Four Pinocchios and a Pants on Fire. 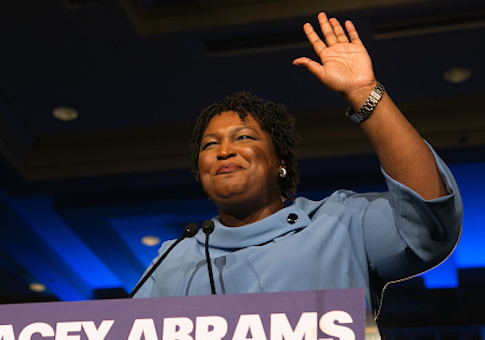 Abrams did not win her election—she lost by more than 50,000 votes—and Kemp exceeded the 50-percent threshold to avoid a runoff. Also, digging into her complaints about Kemp—Georgia's secretary of state before becoming governor—reveal her claims of a rigged race are unfounded. Turnout and registrations? They spiked in Georgia during his time in office. The purging of inactive voters? Implementation of a law passed by Georgia Democrats in the 1990s. The 53,000 voters placed on "pending" status by Kemp's office? They could still vote, in spite of violations of "exact match" laws that were frequently committed by Abrams's own voter-registration group. Knowing this is the difference between reading a headline and reading a story. And Clinton, who said "one of our hallmarks has always been that we accept the outcomes of our elections"? She said Abrams's race was stolen from her. So did Sen. Sherrod Brown (D., Ohio), and 2020 candidates Sen. Elizabeth Warren (D., Mass.) and Sen. Cory Booker (D., N.J.). Yet Morning Joe did not burst into flames over these revelations. At least Abrams has been consistent in her complaints. Gillum conceded to Republican victor Ron DeSantis the night of the election in Florida, then retracted his concession several days later as a machine recount began, and then conceded again when the recount showed him trailing by more than 30,000 votes. But basking in the glow of a Bill Maher audience, Gillum cast doubt anew on the integrity of his and Abrams's races on Friday. "Guess what? Had we been able to legally count every one of those votes not just in Florida but also in Georgia, I wonder what the outcome may be," Gillum said. If @AndrewGillum had evidence that he could have won. I wish he'd share it. I'd be happy to analyze the data. Gillum accepted the results of the recount in November. What changed? I'll leave you to imagine whether Republicans who are considered the future of their party would go uncorrected by our nation's cadre of fact checkers if they made these sorts of charges. Again, these are no back-benchers. They are often included in lists of names of possible presidential candidates in 2020 and beyond. Abrams delivered this year's Democratic State of the Union response. They should be called out by someone other than conservative media for their sore-loser-at-best, conspiratorial-at-worst blather. Until then, enjoy pretending Trump will chain himself to the Resolute Desk the day of President-elect Andrew Yang's inauguration. This entry was posted in Politics and tagged 2018 Election, Andrew Gillum, Brian Kemp, Hillary Clinton, Ron DeSantis, Stacey Abrams. Bookmark the permalink.